Although students are generally encouraged to complete the five core courses in sequence, many courses can be completed out of sequence and/or concurrently. Please see the information in the Core Courses section for details about course prerequisites and sequencing. The Print/Online Track is designed for students who want to focus on writing and reporting for print and online media. The Broadcast Track is for students who wish to focus on reporting and video production for broadcast media. Although students are not required to formally declare their track (and it will not be specified in Albert or on their diploma or transcript), they will need to choose which track they want to pursue before taking The Beat and Advanced Reporting. 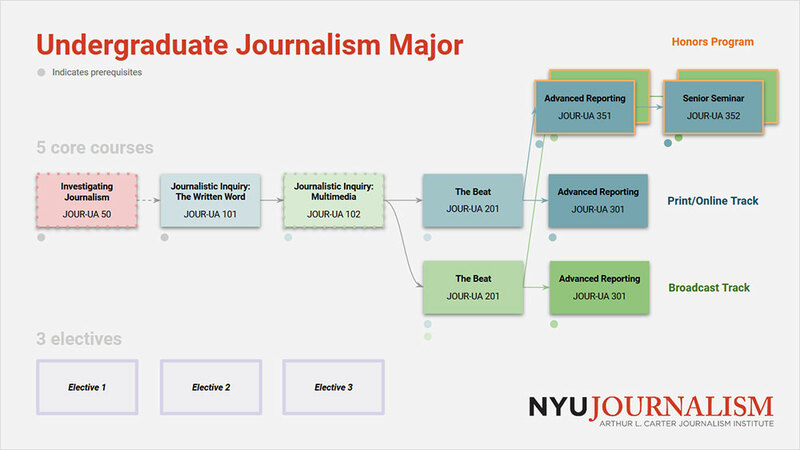 Effective Fall 2019, the Journalism Department will offer two journalism minors. Please visit the Declare section for information about declaring a minor. Please see the information in the Core Courses section for details about course prerequisites and sequencing. The Minor in Print and Online Journalism consists of 5 courses, including two core courses and three electives. Students begin by taking Journalistic Inquiry: The Written Word (JOUR-UA 101), followed by a print section of The Beat (JOUR-UA 201). In addition to these 2 core courses, students complete 3 electives. The Minor in Broadcast and Multimedia Journalism consists of 5 courses, including three core courses and two electives. 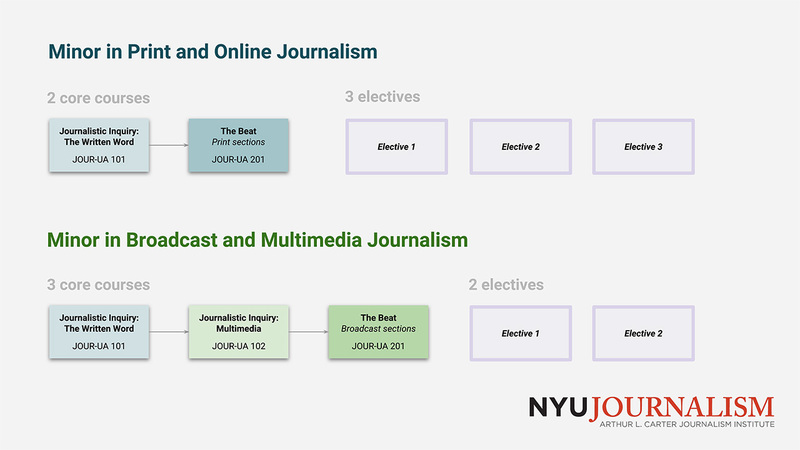 Students begin by taking Journalistic Inquiry: The Written Word (JOUR-UA 101), followed by Journalistic Inquiry: Multimedia (JOUR-UA 102), and a broadcast section of The Beat (JOUR-UA 201). In addition to these 3 core courses, students complete 2 electives. For details about the curriculum, including course prerequisites and sequencing options, please visit Core Courses.